Spotify has finally brought its music streaming app to the Apple Watch. The company was beta testing the new app last week, and now it appears to be rolling it out in a broader release. The feature set is limited compared to the traditional Spotify app, but it integrates with ‘Spotify Connect’ to act as a remote for compatible devices, and it allows you to save songs to your library. The watch app consists of two screens. The leftmost screen shows your recently played albums, artists and playlists. The right screen is the currently playing section. It also features play/pause and skip buttons alongside a heart icon to add tracks to your library and the symbol for Connect. Spotify mentions in its press release that the ability to play locally stored music on the watch is coming in a future update, though the feature isn’t ready yet. The update, ‘version 8.4.79,’ is rolling out to users throughout the next week. To download the new version, I was forced to delete my Spotify app and redownload it. Take note though: if you do this, you’ll have to redownload your library to your phone’s storage all over again. 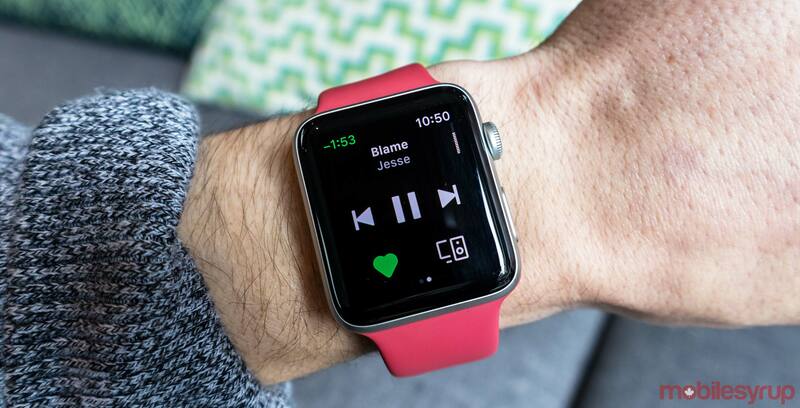 Compared to Apple Music on the Apple Watch, Spotify is left in the dust. Apple’s app includes all features you’d expect from a media player, including access to all your music, the option to save it locally, and even simple controls like shuffle and repeat. The most interesting aspect of the Spotify watch app is the small heart. Spotify used to utilize a plus button to add songs and a checkmark to signify that it was in your library. Don’t get me wrong though; while I love the look of the heart, it makes me wish there was an easy way just to signify that you like a song, like using hearts in Apple Music. Either way, the hearts seem like they’re here to stay since some versions of Spotify mobile are already being switched over.